Australia has been simply churning out top notch new death metal these days. The latest (and quite possibly greatest) of these bands is Inhuman Remnants a ridiculously brutal act whose harsh growls and destructive blast beats will pummel you into submission. 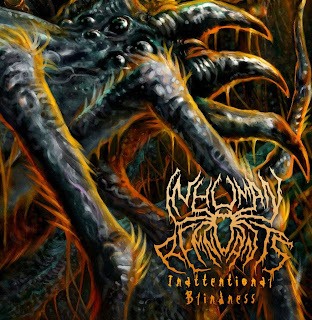 These guys know how to chug, crush, and simply breathe death metal with every song on their new EP Inattentional Blindness. Though it has a mere four songs the talent here is incredible and the raw volume, a product of sublime brutality is suffocating, leaving the listener gasping for air, as if they awoke in a casket. The pure unadulterated attack of the Inhuman Remnants sound is the first thing that came out and struck me on the nose. The crippling riffs and madcap solo that start off the opening track (appropriately titled, Inattentional Blindness) you know that this band is bringing something exciting and new to the table. I mean, sure, they respect the maxims of the genre, but few other bands can really compare to the crippling power of Inhuman Remains. They will crack your ribs as they drown you in an ocean of evil, this is what brutal death metal should sound like, rather, this is what the best brutal death metal sounds like. As I let myself be overcome by blast beats the final message of Inattentional Blindness reaches out and grabs me by the throat. No matter what, things can get more brutal, the world can get darker, and The Suicidal and The Murderous will prosper. (Speaking of which, that's another killer song on this record) Inhuman Remnants know how to groove and suggest that the Canberra scene is one to be feared. Dive into the pit and prepare to get down with some truly exciting metal masters, this is crazy brutal death metal at its finest and it will make a remnant of you!